How to Install VIM editor in Ubuntu ? This article is about how to install vim editor in Ubuntu? You might have heard about vi editor, which is basically designed for Unix like environment. In this tutorial we”ll talk about vim as it is a clone of vi editor called as Vi-Improved, but the major difference is that the vim editor is built for cross platforms and not for the single platform whereas the Vi-editor is for the single platform only. What literally the Vim editor is meant for? The Vim is an indispensable tool, used widely across the globe for the purpose of editing, creating, programming and to play with the content of any type of the file. The file can be simple text file (.txt), document file (.docs), c++ source file (.cpp, .cc) and many more. The vital characteristic of the vim editor is that, it can be used for the purpose of programming/ coding. It is more preferred by the developers/ programmers over IDE’s like Eclipse, Netbeans, etc. Vim editor is the upgraded version of the vi editor with some inherited features of vi editor, and both are “modal” editor. Now, the question arises what are the modal editors? Modal editors are those editors which operates in different modes.For example: The Vim operates in three modes such as Command mode, Input mode and the Last-line mode and if you talk about the Notepad, it’s an Modeless editor as it can only be operated in a single mode i.e Input mode. Vim is based on a command line interface, however it also operates in Graphical user interface (GUI), but is not equipped with all the functions of GUI. It’s rather called as a programming editor, since it works well for the experienced programmers who deals with HTML, XML files usually. This does not mean that, a novice can’t understand it properly, if you are comfortable with the typing and can operate the keyboard with an ease then you will find the Vim very interactive. Step 1: Login to your Ubuntu system, and then open the terminal of ubuntu, if you don’t know how to, then simply press Ctrl+Alt+t. 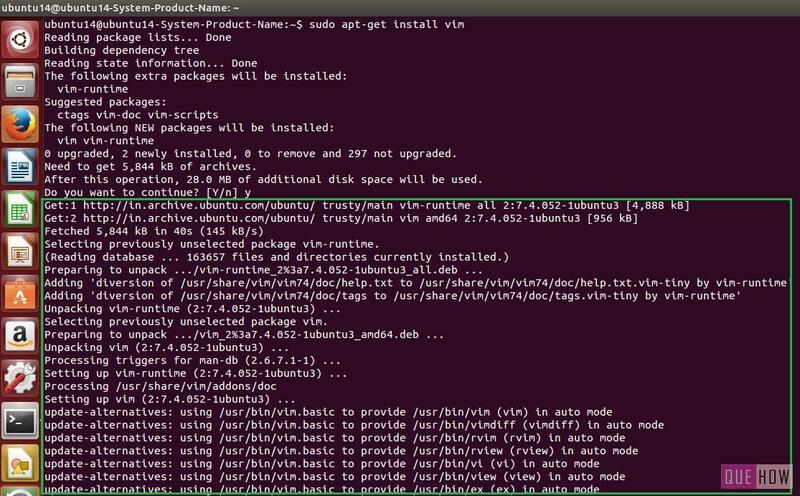 Then type the command “sudo apt-get install vim” and press enter. In case you have recently installed Ubuntu, as I have installed Ubuntu 14.04 (Latest version), the above command would not work out, so you need to simply type sudo apt-get update to install the updates. Step 2: After some operations are performed by the Ubuntu, a text for the confirmation appears, type ‘y’ to confirm. Step 3: Once you type ‘y’, Ubuntu server will perform its operations, as shown in the figure. Step 4: Now, you can open Vim editor, just type “vim” command and enjoy the editing with this editor. 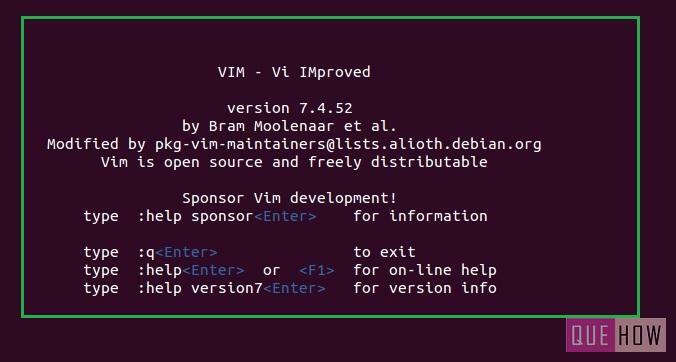 Step 5: Vim editor welcome screen will appear, here you”ll see the help sponsor and help option that can be clicked to know more about Vim. How to use VIM Editor in Ubuntu?